How do you find your Android phone? Let us show you how. There are a handful of phone recovery or anti-theft apps on the Google Play Store which can be a lifesaver in case you want to find a lost phone or, even worse, a stolen phone. But many people might only realize that there are such apps AFTER it got lost. Then it usually is too late and you have to face the ugly truth that the phone is gone for good. To find a lost Android phone it usually still needs a working internet connection in order to transmit its location. To get the best location results it should have an active connection to a WiFi network. Whatever your situation might be, we’ll cover here the most common options as well as more out of the box approaches to cover also edge cases. Find My Device is Google’s official and easy-to-use tool to track your lost Android phone or tablet. The best thing about it is that you don’t need to install an app to be able to track your devices. The only requirement is that your Android phone is connected to your Google account, turned on and connected to the internet. All you need to do is visit the Find My Device website while being logged into your Google Account. Once the site is loaded it will automatically try to track down your lost phone. If you habe several Android devices registered, make sure the right one is chosen in the menu. In a recent update, Google implemented some of the features into their search results page. This means that you’re able to quickly locate any registered Android device right from the search results. 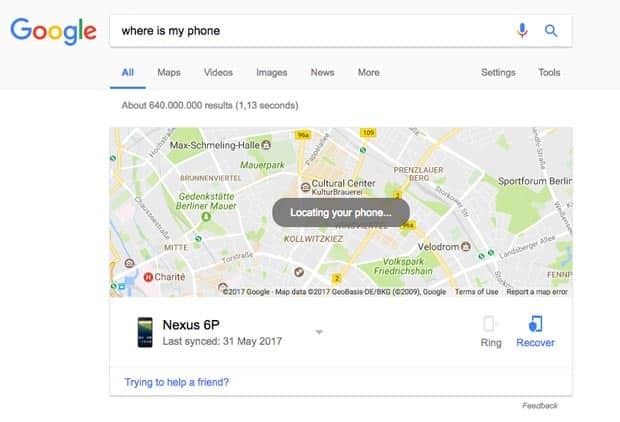 By using the search phrase “where is my phone”, Google displays a little map above the search results in which it will try to find your lost Android phone. Once found, you can let it ring by clicking on “Ring”. Although this makes it more convenient to find your lost phone quickly, it won’t offer you all the options you get with the full interface of Find My Device. By using it, you are able to track your registered Android devices, let your phone ring and wipe your phone’s data (which has to be enabled on your phone). Besides that, Find Your Device doesn’t offer more options to remote control your lost phone. I hope that Google keeps improving it and introduces more helpful features, such as taking a selfie of the person using it in case it got stolen. Are you not able to locate your lost Android phone this way? This can happen for several reasons. The one you should hope for, is that your device is simply not connected to the internet or turned off. In that case, simply keep trying to track it until it (hopefully) connects to Google’s services again. Unlike the Find Your Device tool, the Timeline feature of Google Maps doesn’t actually focus on tracking down a lost phone. You can use your location data for many different things such as looking up past travel routes. However, it is also a good way to locate your lost phone. As mentioned, if your Android device is turned off, you can use the location history data to identify the last recorded location. This means, even if your phone’s battery ran out you might still be able to find it. Here’s what you need to do. 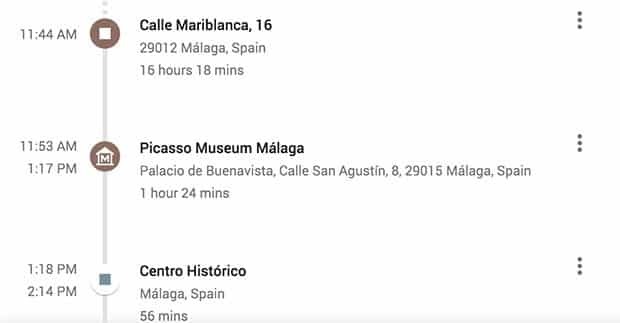 Go to the Your Timeline (former Google Maps Location History) and make sure the current day is selected in the calendar. On the left sidebar, you can see a complete timeline of that day including the names all recorded locations. On the right, you can see all the locations visualised on a map. In case your device actually got stolen, you might be able to find it using the backup and sync feature of Google Photos. If you activated this option in the app, then all images taken with your phone will be uploaded to your Google Photos account. Why is that good news? Well, not just the image but also the location where it was taken is uploaded. So, in case the thief didn’t log out of your Google Account and tried out the camera on your phone, there might be some new images popping up in Google Photos. Obviously, this only works if your lost phone has an active internet connection and if you gave your photos app the permission to use your location. Please be careful in case you are able to identify the location of your lost Android phone, which might very well be the home address of the thief. Don’t try to find it yourself! Use that information and call your local authorities to take it from there. If you have a Samsung device, you might be able to find your lost phone using Samsung’s own tracking service ‘Find my mobile’. For this to work, you need a Samsung account and registered your device before you lost it. So try to remember if you did that. In case you’re device was stolen, Dropbox can be your last resort if all other approaches don’t bring you any closer to finding your lost phone. For this to work, however, Dropbox needs to be installed on your phone and the “Camera Upload” feature has to be activated. This way, every time your phone’s thief takes a picture, it automatically gets uploaded to your Dropbox “Camera Uploads” folder. So, if he or she takes a nice selfie you might be able to identify the thief. And if you’re lucky, you can make out the location by looking at the background of the uploaded pictures. In case you have a rooted Android device, you’re able to use a flashable ZIP file to install it on your phone. This way, even if someone else resets your lost Android phone back to factory settings, Cerberus will still be installed on your device. For more infos on that, check out our article on Cerberus. Lost Android is quite similar to Cerberus and offers a lot of different remote control options including tracking your lost phone, wiping its data and taking pictures remotely. Don’t judge the rather basic look of the Lost Android website which functions as the interface from which you can locate and control your device. It does its job well and even the developer behind the app states on the site that he’s an engineer and not a web developer. I changed my Google account password. Can I still locate my Android phone? Changing your Google password after you losing your phone is a totally logical thing to do right? You don’t want someone else have access to all your emails, drive documents etc. You can go ahead and change your password without losing the ability to track your device. 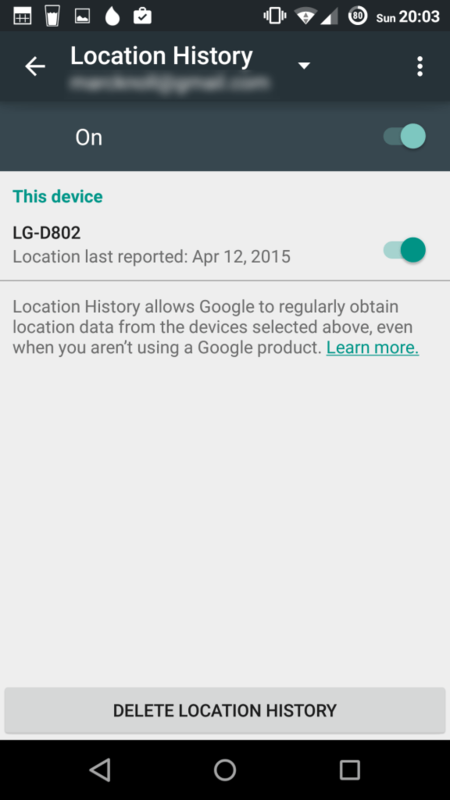 Methods like Android Device Manager will still work. Shouldn’t you be able to locate your phone with ADM then I suggest you check the last recorded location using your phone’s location history. Can I track my lost phone if someone made a factory reset? That’s an easy one – No. As the name already implies, resetting a phone brings it back to its factory settings. The most important thing you need – connection to your Google account – won’t be there anymore. If you haven’t installed a tracking app with root access, such as Cerberus, then you won’t be able to locate it anymore. Can I find my phone using my IMEI number? 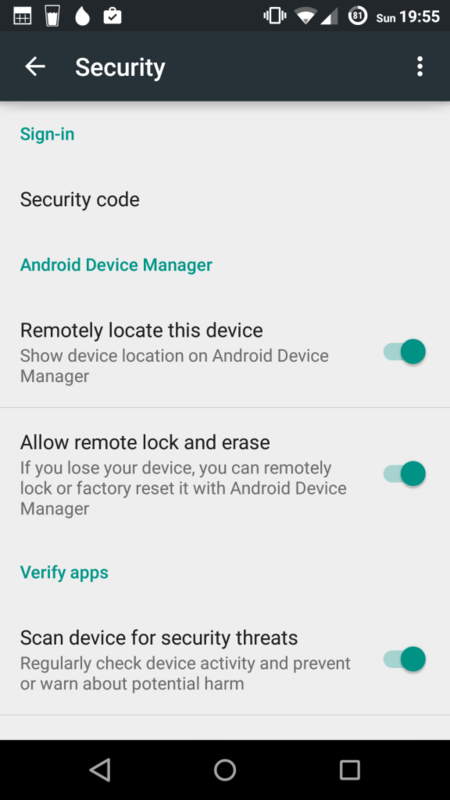 Locating your lost Android phone with its unique IMEI number isn’t really possible. In some cases, the police can work together with a phone’s provider to locate it using its IMEI number. But don’t think you can just walk into a police station and expect them to do that. A more realistic thing you can do is to block your phone so that no one can use it to make calls, send texts or use the web. To do so, the best thing is to contact your provider. By the way, you can find out your phone’s IMEI number by dialing *#06#. This code should work on most phones. Don’t have your device at hand? Here’s how to find the IMEI without having the phone. Even if someone puts his SIM card in your phone, you might be able to locate it. Changing SIMs doesn’t disconnect it from your Google account, which is a good thing. It means that tracking tools like Android Device Manager or Android Lost should still work. The only needed thing in this scenario is that your phone keeps an internet connection. My phone doesn’t show up on Find My Device. Why is that? This can have many reasons. Your phone could be off, disconnected from the internet or your Google account. Keep in mind that changing your Google account password will automatically disconnect it from Google. Also, trying to locate a device with Find My Device doesn’t always work. I recommend that you keep trying to locate your lost phone every half hour or so. Your phone might have a bad connection or someone else turns it on and connects to the web. But if you changed your Google password, then Find My Device won’t be able to track it. Do you still have unanswered questions? You’re more than welcome to post your question in the comments! We received a lot of emails, tweets and comments the last months from people that found their lost phone thanks to this article. Unfortunately, the majority of the readers isn’t that lucky. Either way, if you found your lost phone or plan to buy a replacement, you should be well prepared before something like that happens again. Below are two fundamental steps you should take to quickly track down your device should you lose it again. Make sure that both Find My Device and Location History are activated. Both tools can be a great help when you lose your device. With Find My Device you can track your device, make it ring and erase its data. Location history shows you the last recorded locations on a map. If someone stole it, then this could help you (and local authorities) to track down the thief’s home address, for example. To activate both services, select “Google Settings” in your app drawer. Select Security and make sure both options below “Find My Device” are enabled. Now, go one step back and select “Location”. Click on “Google Location History” and turn it on. Now you’re able to use the tool to track your device and Location History to see its last recorded locations. Quite a lot of people already use lock screens to keep unwanted people from accessing private files like images, texts or videos. For some people, unlocking a phone countless times a day can be quite annoying, but it’s worth it. This extra layer of security not only keeps your friends and colleagues from secretly checking out your latest images or texts. It also prevents thieves of changing any major settings such as disabling mobile data or disconnecting your phone from your Google account. 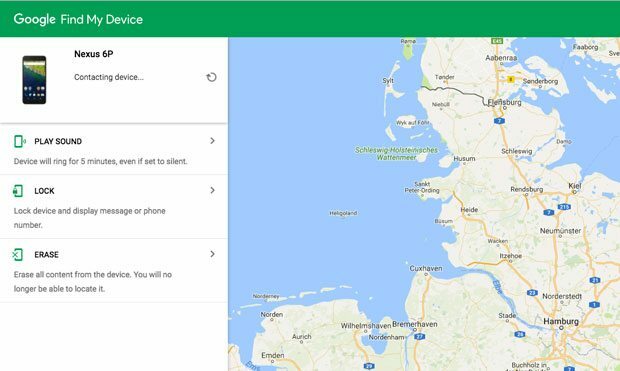 As you learned, both a working connection to the web and a connected Google account are needed to get your Android phone’s current location. Have you been able to get back your mobile device after it got lost? How did you get it back? Share your experience with us in the comments. Note: In case you’re actually missing an Apple device, head over to my guide on how to track a lost iPhone or iPad. For windows phones, check out this post.